A photo of Auburn University’s main gate from the 1929 Glomerata. Neither of the two large trees between the gate and the streets is a live oak. The tree in the center of the 1899 photo of Toomer’s Corner framed and hanging in the offices of Auburn fans across the state is not one of the iconic Toomer’s Oaks, recent research conducted by an independent group of Auburn fans revealed. That photo, as well a 2007 article published in Auburn Magazine, had been used to date the trees age to be approximately 130 years old. A recent study of old photos housed in the Auburn University archives suggests that the two cherished live oaks are actually around 75 years old. This 1937 photo shows that the two large trees found in the 1929 photo had been removed. The Toomer’s Oaks had not yet been planted. 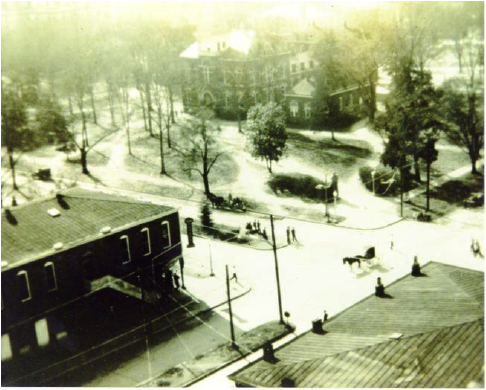 Though large trees have lined the College St. and Magnolia Ave. boundaries of Auburn’s campus since the late 1800s, a photo taken by an Auburn freshman in 1937 shows that the Toomer’s Oaks had not yet been planted. 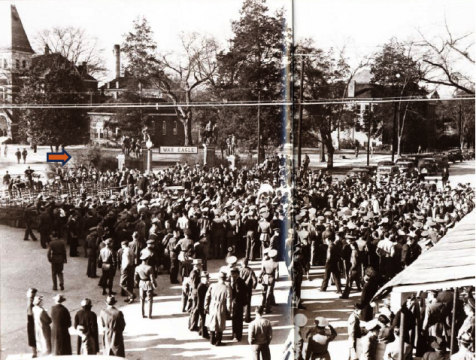 A photo in the 1929 Glomerata shows two large trees at the campus’ main entrance, but according to Dr. Gary Keever, an endowed professor in Auburn’s Department of Horticulture and point person for the Toomer’s Task Force, neither tree is a live oak. The first photo found showing what is believed to be the Toomer’s Oaks is of a January 4, 1938 celebration of Auburn’s 1938 Orange Bowl win over Michigan State on New Year’s Day. (A print of the photo is actually on display in Toomer’s Drugs.) The size of the trees—both are approximately 8 to 12 feet tall—indicate that they would only have been 6 to 10 years old at the time. That would likely place their planting in 1937. The orange arrow in this 1938 photo featured in “Auburn: A Pictorial History of the Loveliest Village” points to one of the Toomer’s Oaks, which was just 8-12 feet tall at the time. Though the new estimate slightly dents the historical significance of the oaks (and possibly the likely apocryphal “ticker tape” theory on the origins of the rolling tradition), the emotional impact of the trees’ poisoning could, in a sense, increase as their pre-Spike life expectancy would have been much longer. A recently released report on the findings shows a chronological progression of the oaks’ growth and can be downloaded from the university’s Toomer’s Oaks update page. It takes more than 200 hours each month to produce, edit, and maintain The War Eagle Reader. If you like what we do, and you’d like to help TWER keep the lights on and the obsession with Auburn lore unhealthy through winter, please consider making a small donation or advertising with us.